After the 1960s, rapid urbanization in developing regions in Latin America, Africa, and Asia was marked by the expansion of low-income "irregular" settlements that developed informally and which, by the 2000s, often constituted between 20-60 percent of the built-up area of metropolitan areas and other large cities. There has been a variety of research directed at the housing policies involved with these informal settlements, yet apart from the activities of Latin American Housing Network (LAHN), there has been minimal attention directed at the earliest portion of settlements that formed some 25-40 years ago that now form a large part of the intermediate ring of the cities. This volume breaks new ground by opening up a new generation of housing policy in Latin America cities with broader application for other developing countries. Its editors bring unique perspectives: Peter Ward coordinates the LAHN, and Edith Jiménez and María Di Virgilio are founding members of the network who have led project teams in Guadalajara and Buenos Aires respectively. Developed as a coordinated collaborative research project, the volume encompasses nine Latin American countries and eleven cities. The editors and contributors offer original perspectives on the policy challenges facing much of the low income housing of Latin American cities; document the changing nature of the "first suburbs"; present comparative survey findings in order to better understand the types of consolidated settlements that exist today; describe the physical nature of the dwellings themselves; identify the reasons behind market dysfunction that impede the operation of consolidated housing informal markets in Latin American cities; and outline a new generation of housing policies that will support the processes of densification, rehabilitation, and regeneration of these settlements. This book is the first and only composite overview of the research findings and advocacy of the generic policy lines that the LAHN identifies as central to a new generation of housing strategies and approaches. Researchers and practitioners working on housing theory, housing policy, comparative spatial and sociological research, and urban development issues will find the book highly significant. "The original research in this volume provides a landmark for anyone concerned with improving the lives of urban residents. Ward and his colleagues uniquely demonstrate the significant challenges facing cities while providing concrete solutions to meet the future needs of consolidated settlements." "Since the 1960s and 1970s urban areas throughout Latin America have been shaped by informal settlements. Now fully serviced and consolidated, these apparently ordered low-income settlements have been largely off the radar of city and housing planners. 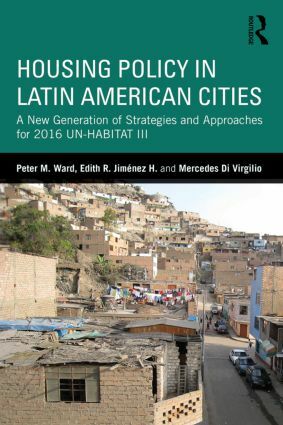 In this path-breaking comparative study of ten cities, Ward, Jiménez, and de Virgilio and their colleagues of the LAHN make a highly significant contribution to reshaping housing policy in the region, and to ensuring that some 50% of the inhabitants of our large urban areas are now firmly back on the policy map." "the book does a wonderful job in demonstrating the need for more innovative housing policies that take full advantage of Latin American cities’ hidden assets in order to tackle the persisting problems of lack of adequate housing for lower-income groups and dysfunctional, costly suburban growth. Hopefully, some of these ideas will find their place in the discussions that will take place in the upcoming 2016 UN-HABITAT III." Peter M. Ward holds the C.B. Smith Sr. Centennial Chair in US-Mexico Relations, and is professor in the Department of Sociology at University of Texas-Austin. He was formerly director of the Mexican Center at LLILAS, and served as Executive Editor of the Latin American Research Review between 2002-07. He is author or co-author of 17 books and over 100 journal articles and book chapters on low income housing, land markets, social policy, democratization and governance, Mexican politics and megacities (most notably Mexico City). He is the coordinator of the multi-city Latin American Housing Research Network. Edith R. Jiménez Huerta is Professor at the Center of Economic and Administrative Sciences at University of Guadalajara, Mexico. María Mercedes Di Virgilio is Professor of Sociology at University of Buenos Aires, Argentina.